In her Sanctuary Our Lady of Charity of Cobre, 12 miles Northwest of Santiago. You can take a taxi or the no. 2 bus that runs four times daily from the main bus station in Santiago. Open daily from 6:00 am to 6:30 pm, 16/17th century?, 30 cm. Her head is made of baked clay covered with a polished coat of fine white powder, possibly rice paste, then painted. Most representations of the Queen of Cubans portray her as rather light skinned, but some depict her as black. The actual statue is generally regarded as a ‘mulata’, a woman of mixed race like the flock of her Cuban children. Her eyes and hair are indeed pitch black. A recent thorough renovation did a good job of revealing well shaped features that had been deformed by countless coats of paint, but it also made her look even whiter. Her feet rest on a silver moon whose ends surround the silver cloud where three cherubs spread their golden wings. Baby Jesus raises one hand in blessing; in the other hand he holds a golden globe. His Mother holds a cross in her right hand. It used to be a golden one. Why would I count this Lady among Black Madonnas? One, because her Cuban children see her as dark. Two, because, like so many of her sisters, she has a connection with a non-Christian Dark Mother. Hers is actually particularly strong, because she is simultaneously worshipped as the Mother of Christ and as Ochún (or Oshún), the Afro-Cuban Yoruba goddess of love, dancing, femininity, sweet water, and gold. The Church seems to have made its peace with the fact that Our Lady of Charity draws not only Catholics, but also crowds of non-Christians and faithful with dual identities into her church. In any case, the Catholic caretakers of the shrine mostly keep her dressed in yellow and gold, the colors of the African goddess, as if to keep the Yorubas happy. Of course it may just be that Ochún’s color has become so much part of Cachita that no one would want to miss it. Even her Catholic devotees dress in yellow for her special holiday celebrations on September 8th and July 25th when thousands come to her on pilgrimage. Good old syncretism is alive and well in Cuba! 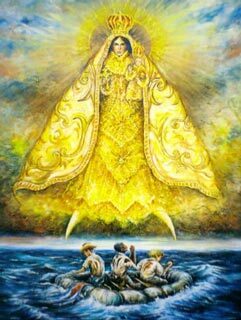 People get confused about the fact that the Lady of Charity of Cobre is described in paintings and words as an apparition, similar to say, the apparitions in Fatima. They wonder if there was an apparition of the “actual” Virgin Mary or if it was “just” the statue that was found. The fact is that when a statue appears in a miraculous way, it is, to her devotees, just like their Mother appeared in the flesh. So what happened? “The statue was originally taken to Barajagua, a nearby settlement, but it kept disappearing. She would disappear at night and return in the morning with her clothes wet. (…) Finally people understood that she wanted El Cobre to be her permanent home. Her location next to the copper mines is usually interpreted to mean that she looked out for the slaves who worked in the copper mines. In the Santería narrative, Ochún came to Cuba because she was despondent over her children being taken away from her by slave traders. She asked her sister Yemayá what Cuba was like, and Yemayá pointed out the similarities between Cuba and Yorubaland but noted how the people in Cuba looked different. Ochún then requested that Yemayá make her skin lighter, turning her skin a copper color, and her hair straighter so that all Cuban people could accept her. Thus she traveled to Cuba and was soon loved by all Cubans. Originally, mostly slaves were the ones who worshiped Our Lady of Charity. This shifted during the Ten Years War (1868–1878) between Cuba and Spain. The clergy, who was in favor of Cuba's independence, prayed to Our Lady of Charity, believing that she was on their side. Then in the 1895–1898 war for independence those in favor of independence prayed to Our Lady of Charity, including the revolutionary soldiers. Thus she became known as “La Virgen Mambisa” (the revolutionary virgin). (*3) After the war, in a letter dated September 24, 1915, the veterans petitioned the Roman Catholic Church to have Our Lady of Charity acknowledged as the national patroness of Cuba because of the way she had helped them reach independence. On September 8, 1916, Pope Benedict XV approved this request. The official website of Our Lady’s sanctuary adds a beautiful article on how the Virgin of Cobre and her clergy helped liberate the slaves of the Cobre district during a whole century of struggle against the Spanish crown. (*5) It also confirms that “… there was certainty among the people that the Virgin Mary under the title of Our Lady of Charity of Cobre accompanied and protected the Cubans in the search for their independence.” Like other Black Madonnas (e.g. of Czestochowa, Poland and Wilna, Lithuania) the Queen of Cuba became a symbol of national identity and independence. (*6) Nor is she the only Black Madonna that has been credited with helping liberate the slaves and standing by the oppressed. Apparecida do Norte in Brazil and some Italian BlackMadonnas enjoy the same reputation. For more, read in the introduction under Leftist Views. To this day the faithful come from across Cuba on pilgrimage to this Brown Madonna and her image can be seen throughout the country. 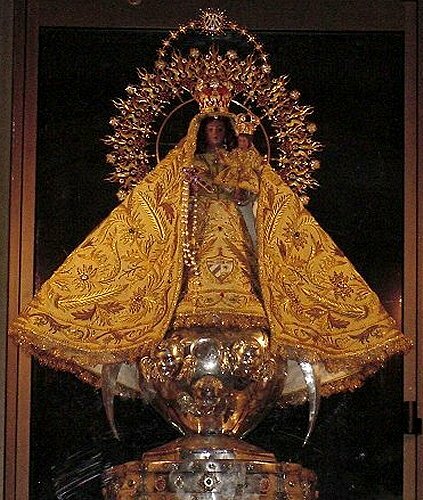 *2: "Cachita-Ochun: La Virgen de La Caridad del Cobre"
*3: Especially one famous copy of Cachita in Santiago is known by that title, but it describes well who the Virgin of Cobre has been for Cuba.